United frequent flier Katherine Wenglikowski loathes the stinky smell of public bathrooms, but she was pleasantly surprised by what she found in the lavatory on a recent United Airlines flight from Los Angeles to Newark, N.J.
She couldn’t help but notice the same smell on the return flight too. “I’m largely scent challenged and find most overwhelming, but this grapefruit one is working for me,” she said. In recent years, U.S. airlines have rolled out their own custom fragrances as part aromatherapy and part branding exercise. Big luxe-hotel chains, like Westin, Ritz-Carlton, and Shangri-La, have for decades scented their lobbies, gyms, and meeting rooms as a marketing mechanism. The use of scent to sell everything from airlines to shampoo has been around for years- remember Gee, Your Hair Smells Terrific shampoo? (It’s still for sale.) In 2014, London Heathrow installed a “scent globe” allowing passengers to delight in the scent of various countries. A growing number of airlines believe coming up with an olfactory logo might help them too. That scent Wenglikowski caught a whiff of? United calls its own proprietary fragrance Landing. It’s said to exude the aroma of orange peel, bergamot, cypress, black pepper, black tea, sandalwood, leather and more. 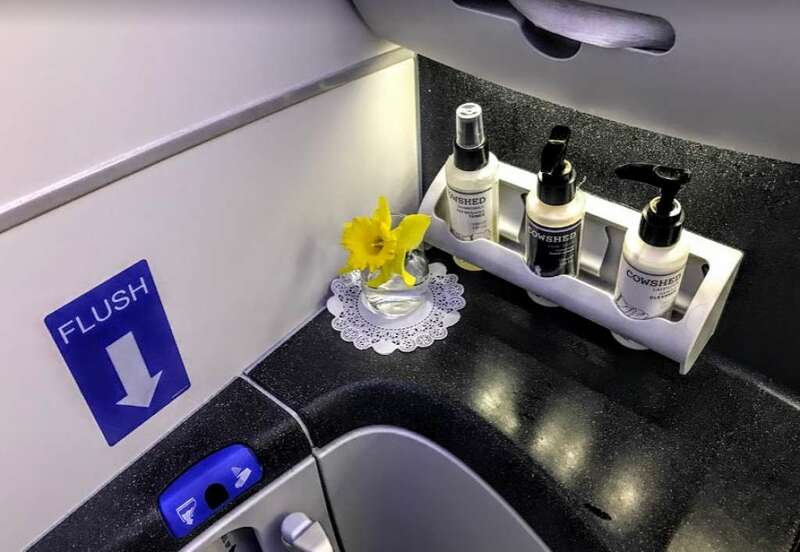 Delta Air Lines led the way amongst U.S. carriers when in 2015, it debuted a signature scent called “Calm,” a mixture of lavender and chamomile. Carriers are infusing their scents into hot towels, soaps, lotions, lavatory deodorizers, at gate areas, and in the lobbies of their respective airline lounges. All have said they’re careful not to overdo it — cognizant of fliers who are allergic to strong perfumes and colognes. At United’s Polaris business class lounge locations, fliers checking in at the mood-lit lobby can pick up hints of its “Landing” fragrance wafting in the air. They’ll also be serenaded with a playlist of music that was curated especially for the airline. Want to bring that scent home? From the United shop, you can buy a United Polaris Reed Diffuser for $41 or scented soap for $8. The sight, smell and sounds of checking into the lounge are designed to make for a full-on sensory experience, according to airline staff. Outside of the U.S., Air Canada, All Nippon Airways, Cathay Pacific, Turkish, and Virgin Atlantic are among the international carriers that have their own fragrances. Singapore Airlines has been famously perfuming its cabins for decades. Have you noticed? Many other carriers are planning to launch their own scents soon. What do you think of branded scents diffused by travel suppliers? What’s your favorite?